okay, thank you very much for being so responsive. I can confirm now that my previous assumption was correct, i.e. 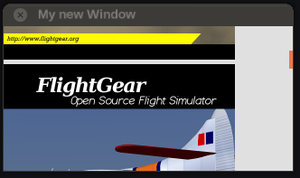 your graphics card drivers is apparently unable to deal with the way FlightGear is integrating legacy and OSG OpenGL code. You could also try the debug/devel extensions menu for the map related issue (white boxes). To be really sure that this not the slightest bit related to any effects/shaders, you could next try to play with various effect/shader detail levels (running the same snippet), and once you are done with that, you could even try Rembrandt. That being said, this seems sufficiently conclusive to state that people on AMD/ATI hardware with similar problems (graphics artifacts showing up in combination with PUI elements) would greatly benefit from a modernized integrated GUI, no matter if that means Qt5 or Canvas. However, given that Qt5 is going to remain an optional build dependency, it would seem like a good idea for people with AMD/ATI hardware to join the Canvas/UI effort, e.g. by helping with testing, screen shots etc, so that we can gather more feedback, and specifically support those platforms/people. It would be interesting to know if there are any graphics artifacts or not. In summary, anybody with ATI/AMD hardware (drivers) seems particularly likely to benefit from the Canvas effort as a whole, no matter if that means working splash screens, GUI, MFDs or HUDs/2D panels. probably my fault, not yours - thanks for reporting though, will need to test the snippet and fix up the wiki article. In the meantime you could try the debug/devel extensions dialog to get a moving map and check if there are any white boxes there or not. In addition, you could try playing with different shader/effect settings while running any of those two dialogs (the splash snippet and/or the moving map dialog). If no white boxes show up again, it was PUI related - if they do, it's unrelated to PUI, and may still be related to effects/shaders. DOH wrong pic here it comes again! that looks reasonable - but you changed more than I asked you to change - i.e. you even took over the "exit" part, even though I asked you to use "about" instead - the difference being the file name (dialog) it loads from the base package. The exit dialog is a bit too simple for this taste - but "scenario" or "viewl" will use plenty of raster images for adding check boxes to the UI. Last edited by Hooray on Fri Oct 23, 2015 8:58 pm, edited 1 time in total. I'm sorry, you are correct re 'exit', 'about'. I was looking at the wiki for the string and not your post. here it is again. you could try "view" and/or "scenario" next, to ensure that raster images are shown properly. But overall, it seems that a Canvas-based UI could help address most/any ATI/AMD related issues we're seeing in FG, including even features unrelated to the GUI (2D panels, HUD, splash screen, MFDs). TheTom wrote: That's definitely a problem with ATI. I've tried an HD 7870 on Windows as well as Linux with different driver versions, but all showed the same problems with different intensity (mainly flickering of some parts and other buffer contents) and different applications using OpenGL (eg. FlightGear, Blender, Spotify). Hooray wrote: That's probably related to your hardware being ATI/AMD-based, and the PUI (legacy GUI) integration with OSG code, and a few incompatible/untested settings (think shaders/effects, rembrandts/als etc) - PUI is fixed-function pipeline code, while most of FG is increasingly being moved to support more modern code using shaders and effects, or at the very least OSG StateSets. TheTom wrote: While working on the new GUI based on Canvas I have not noticed any problems so far, so it should not suffer from the clipping problems. yes, that's looking very good - note that this is the existing PUI/XML dialog, parsed/converted (translated) to Canvas at run-time, and it looks perfectly reasonable, despite using raster images. You could try the debug/devel extensions "canvas self test" for the moving map check. Otherwise, it is pretty safe to say that the Canvas UI effort would greatly benefit anybody with buggy AMD/ATI graphics drivers - as well as help others with poor performance, by unifying the 2D rendering back-end, so that the even the GUI will use the native OSG scene graph internally. It would seem like a very good idea to spread the word about this (e.g. via MP), so that people on ATI/AMD hardware are aware of the positive impact that a Canvas UI may have - even if that should just mean that they leave their vote at the ticket you created. 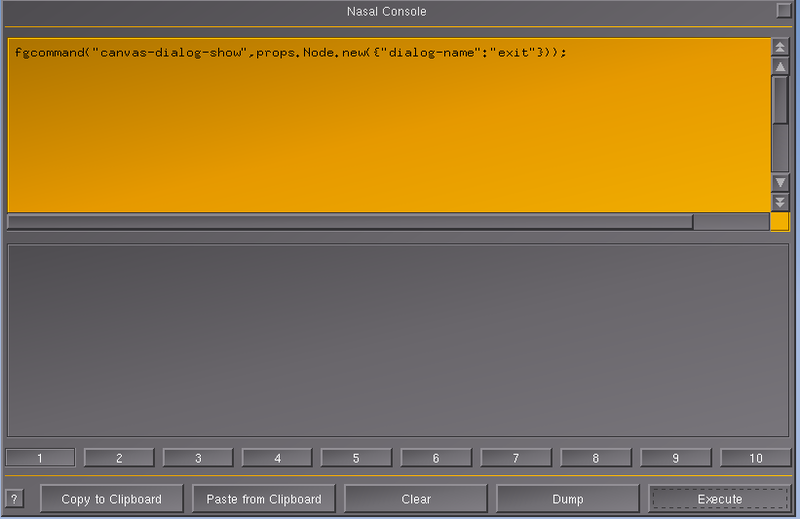 PUI/XML scroll-able SID/STAR combo for route manager dialog ? Gosh my pet peeve is that one can not scroll thru the route manager at Sids and Stars if they are installed, because the dropdowns don't seem to have a way to add scroll bars, said zakalawe to me in IRC years ago. I'm really excited about seeing these things work on my machine and anything I had said in the past that might be construed as derogatory against canvas or nasal is just my ignorance showing thru. I can see this canvas can work ALL OVER THE PLACE in the sim. Very very did I say very yes I said very COOL! Thank you so much Hooray walking me thru this. Just wish I could be more helpful to you. Canvas is certainly not perfect, definitely not for the UI, but it can be improved/extended over time, and it can help unify the 2D rendering code, which would translate into better performance for graphics card that already work, and better compatibility for cards that need to use workarounds (e.g. ATI/AMD). Overall, such problems are not so much a "bug" at the driver level, as they are symptomatic of problematic nature of FlightGear's main loop, and the way all kinds of legacy OpenGL code need to work in conjunction with more recent code.